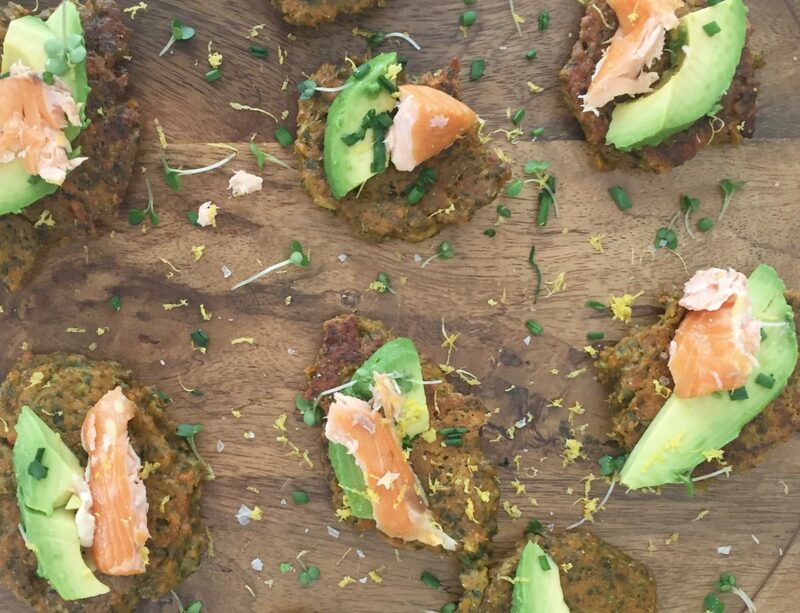 When I bit into these herby carrot pancakes on my last trip to LA, I did my usual food nerd thing of noting all the flavours and textures into my phone and photographing them from every angle so that I could recreate them for class. I’m sure I missed seeing some famous actor walk by because I was so focused on replicating them at home. These roasted carrot fritters are almost totally prepped ahead. I love them topped with avocado and hot-smoked salmon, or with avocado and Feta. They’re also great with my romesco sauce. I make these fritters around 2 inches across for a nibble with drinks. If I’m making them for lunch or brunch, I make them bigger, like American pancakes, and serve them with eggs, bacon, salmon or avocado with some lemon-dressed rocket on top. Leftover fritters are lovely with soup or as a replacement for bread. Roast the carrots up to 4 days ahead and make the batter 3 days ahead. You can make the fritters up to 2 days ahead, then put them in the fridge in a bag or box. You can even freeze them. Re-heat them in a 200°C (180°C fan) oven for 5-10 minutes before topping them with the avocado and salmon just before serving. 220g (8oz) hot smoked salmon or trout, or regular smoked salmon, or Feta. Pre-heat the oven to 220°C (200°C fan) 400°F (425°F convection) . Chop the carrots into discs, around a quarter inch thick. Put them on a metal baking sheet, lined with parchment, and drizzle them with the oil and salt. Use your hands to cover them with the oil. Roast the carrots for around 20 minutes, until they are softening and starting to turn brown at the edges. This stage can be done up to four days in advance if needed. Put the roasted carrots into the food processor with the whole basil leaves and stalks, whole spring onions, eggs, flour, baking powder, smoked paprika, salt and pepper as well as the juice and zest of 2 lemons. Pulse the food processor until the ingredients have come together into a sticky dough. You still want some small bits of carrot and greens visible. You will need to scrape the side of the food processor a couple of times to make sure everything is incorporated. You may need to add a little water if need be. At this stage the batter will sit in the fridge for 2 days. When you’re ready to eat the fritters, heat a large frying pan on a medium high heat. Use 2-3 pans if you want to do them more quickly. Put around a teaspoon of oil in the pan until it is quivering, then spoon in 1-2 tablespoons of the batter into the pan for each fritters. Cook the pancakes for 2-3 minutes, until the edges look to be drying out and small bubbles are visible on the surface of the pancake. Flip, then cook for a further 2 minutes. Test they are cooked through by ripping one in half to see it is dry all the way through. Serve warm. Top each pancake with a little slice of avocado and flaked hot-smoked salmon, a few sprigs of cress or chives, a sprinkle of salt flakes and pepper and lemon zest. You could grate some fresh horseradish over them too if you have some. Find more recipes for carrots, eggs, small bites and pancakes here.